The MISPRO inks are intended for professional use by photographers and artists. They can aid professionals in producing high-end graphics, advertising, archival and fine art prints with Epson printers. This ink set is the enhanced InkSupply.com version of the Epson UltraChrome��� ink, using the latest pigment technologies. Therefore, these inks are designed to work on matte finish paper, semi-gloss, or glossy papers. 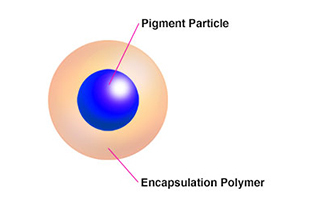 The InkSupply.com formulation is not as shinny on glossy papers as the Epson inks, making your prints more realistic looking. Due to these qualities, MISPRO ink is the ideal replacement for any of the Epson printers using Dura-Bright���, Dura-Bright Ultra���, or UltraChrome��� Epson inks. The inks are available in the correct sets for easy replacement: 8 color, 3 black (matte, photo, light) and 5 color (C M Y Lc Lm) or 4 color inksets (C M Y K). As with all InkSupply.com Inks, MISPRO is proudly manufactured in the US to the highest quality specifications available. Fully compatible with UltraChrome��� printers, flushing not required. No flushing or purging is required for desktop or wide format printers when switching to MISPRO Ink. However, on wide format printers, printing a sufficient number of solid squares of each color is required to fill the delivery tubes between the cartridges and the print head. We recommend that the MISPRO ink be used instead of the InkSupply.com GP inks for the non-Ultrachrome printers. The MISPRO proved superior on glossy and semi gloss papers in our comparison testing. The GP ink suffered from bronzing and flat areas whereas the MISPRO did not (GP being the best we had at the time of testing). Note that both inks require a profile for use on non-Ultrachrome printers. We are working on profiles for the 1160, 1280, 1400, 3000, 7000, 7500, 9000, 9500, R200 and R300 printers. Note 1: To avoid confusion with the 4 different black inks, pay attention to the final letters of the blue part number. 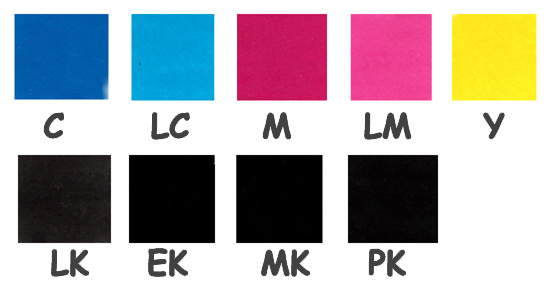 K = Matte Black, MK = Universal Black, PK = Photo Black, and LK = Light Black. All inksets contain Light Black (LK). There are three different inksets available, each with a different black. Note 2: A hybrid Universal Black (MK) is available for those who do not want to change from Matte Black to Photo black (for instance, changing from matte paper to glossy paper). However, the Universal Black has dye in it, and therefore, is not as archival as the matte black or photo black inks. Thus, a trade-off must be incurred to use the hybrid MK.